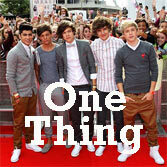 One Direction has put out many great songs in 2011-2012. We did a a dance performance to One Thing and also a chair dance performance to another One Direction song. The dance to One Thing was performed at a local park. Sloane, Katrina and friends put together some dance and gymnastics moves in this video to the song "One Thing" by the band One Direction. We really had alot of fun making this video. Hope you like it too! Leave us a comment on our Facebook page at http://www.facebook.com/fitforafeast. See some of our other dance performances in this section.